Historic Decoration was founded in 2016 by interior designer and consultant Caroline Percy and architectural historian Oliver Gerrish. Our series of study days at Syon House, Salons at Brunswick House, four day course and tours aim to explain and define the many and varied aspects of the history of British interior design and to explore the options available to assist in the restoration and reinterpretation of historic interiors today. Our speakers are all established experts in their respective fields and they vividly describe the evolution of interiors through the centuries and suggest how this knowledge could be applied when decorating a period home in the context of the 21st century. For the amateur as well as the professional, for the owners of historic properties and those involved in their restoration and redecoration, Historic Decoration provides a forum to offer practical advice. 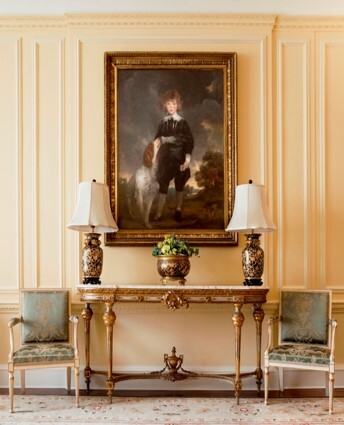 This four-day course provides a basis for the analysis and interpretation of British interiordesign from the Renaissance to the Regency period. Chronologically organised, the tours will highlight key interiors, architects, designers and movements. Visits to historic buildings will be accompanied by in-house experts. The course provides a foundation in the history and development of the English interior from Henry VIII to George IV and is intended for those who are interested in the decorative arts and interior design. We will be based at Hotspur House, the home of interior designer Caroline Percy, which is close to Robert Adam’s Syon Park, her family home. Caroline and architectural historian Oliver Gerrish will lead the course, assisted by Catherine Fellowes. Historic Decoration has teamed-up with Fellows to look at a key aspect of historic decoration - jewellery, as a way of decorating one’s person, as well as its role in historic portraiture. Join Historic Decoration and Fellows Auctioneers at Syon House. Set amid rolling parkland, Robert Adam’s Syon House is one of the last great country houses in Greater London. Sentimental Jewels will be a fascinating day with access to the house and its history. A talk from Art of Mourning’s captivating Hayden Peters will explore the sentimentality of jewellery over the last 500 years and the hidden meaning behind certain objects. After a break for lunch, you will tour the magnificent house, led by interior designer Caroline Percy and architectural historian Oliver Gerrish from Historic Decoration. You will have a chance to relax over tea in the beautiful Green Drawing room with our hosts and speakers. Fellows will be providing some gorgeous period jewellery for you to try on in the context of this great house. Francis Terry is the next generation of a new classical dynasty. He will explain his own motives for using the classical style, its successes, challenges and benefits. Having studied the origin of the word ‘pastiche’ and what it actually means, he found that far from being an insult, it is a compliment of the highest order. He discovered that famous ‘pasticheurs’ include Palladio and Inigo Jones in architecture, Mozart and Tchaikovsky in music and Velazquez and Picasso in painting. With examples, Francis will show how being pastiche is something to be celebrated and an essential part of all good architecture. His book ‘Glad to be Pastiche and other Essays’ will be available for sale at £10. We are associated with Historic Houses, a not-for-profit organisation preserving and promoting over 1,600 historic houses, castles and gardens.